My wife’s Auntie Sadie was born old. I’ve seen pictures of her when she was in her late thirties and, even then, she looked old. One of her most endearing qualities was her wisdom. Maybe that’s why she looked old, because she was so wise. When our kids misbehaved, Sadie would be able to look at things from a number of different angles, take apparently unrelated information, and craft her wise analysis of the reasons for the misbehavior. Her special gift was analysis. In my last two posts, I described three things that the ArcGIS platform does that can transform the way an electric company does its business. They each begin with the letter A. The first is access—the simple ability to give everyone in the company (as well as others such as customers, first responders, and the media) the ability to see its important information on a map, regardless of which device they use, where they are, or what time it is. The next A is awareness. This is the ability to see events as they unfold. Having previously run electric operations for a power company in the northeast United States, I know that Mother Nature can pull a fast one at a moment’s notice. So having situational awareness of outages, floods, blocked streets, blizzards, and tree limbs flying all over the place was critical for expedient restoration of vital services. The ability of the ArcGIS platform to bring together all kinds of information and organize it by location answers the question, what’s going on right now? It also answers the question, where are all these events happening? In this post, I’m going to focus on the third A, which answers the why. That’s analysis. Like Auntie Sadie, ArcGIS can be very wise. Sure, you get to see where everything is and bring in all kinds of disparate data, but the secret sauce of the platform is that analysis helps you make sense of the information. It uncovers patterns. It connects the dots. It creates relationships that you could never figure out just by looking at the data. Analytics is about discovery. Electric companies are famous for acronyms and abbreviations: kVA, kW-hrs, FERC, NERC, CIP, AMI, SCADA, DMS, OMS—and, yeah, even GIS. There is another acronym that reminds me of Auntie Sadie. It’s SAIDI (pronounced, you guessed it, “Sadie”). It stands for system average interruption duration index. It’s a simple measure of how well the electric system performs. SAIDI represents the time, in minutes, that over the course of one year an average electric consumer is out of power within the territory served by a power company. In the United States, scores such as 120 are not uncommon, so a SAIDI of 2 hours could be considered normal. Some countries have SAIDI scores that are much higher and some much lower. High is bad, low is good. Simple. However, if your SAIDI is high, it’s not so simple to figure out how to lower it. When I worked for the power company, we had a special group of people who worried a lot about reliability and SAIDI. They were called, no surprise, reliability engineers. They would rank each of the electric circuits based on its performance. Circuits in an electric company are just big versions of the circuits in your house At home, if you plug too many things into a circuit, you blow a fuse or trip a circuit breaker. Or worse, if someone sticks a fork into a plug, that creates a short circuit and blows a fuse or trips the breaker. The same things happen in a big way for the power company. A tree falls on a power line. The line breaks, falls to the ground, creates a short circuit, and blows a fuse or trips a circuit breaker—and the lights go out. Every quarter, we would come up with a list of the 10 worst-performing circuits and then try to figure out how to improve them. One way to improve a bad circuit was to shorten it. If a circuit was too long, its exposure to bad things was greater. So we would reconfigure it, making shorter circuits a little longer and longer circuits a little shorter. The problem with doing that is it didn’t lower the overall SAIDI; it just shifted bad performance from one circuit to another. In most power companies, SAIDI is a lagging indicator. It is simply one number that covers the whole region for an entire year. While it gives a power company a measure to benchmark itself against other power companies, it’s not that useful for actually improving the performance. But with the ArcGIS platform, electric utilities can make Sadie—ahem, I mean SAIDI—really wise. If power failures occur because of lack of maintenance, failure to trim trees, old equipment, or electrocuted squirrels, reconfiguring the circuit doesn’t help. A better way to look at reliability is by area, not by circuit. Frankly, customers could care less which circuit they are connected to. They only want better reliability. Utilities can employ the ArcGIS platform to create a map of SAIDI by area. These are relatively small areas. Red areas have a high SAIDI—say, above 200. Green areas have a SAIDI below 20. Other colors can be used for all ranges in between. Many utilities now have smart meters that track every minute a customer is out of power. That real-time data can drive this simple map. Utility staff can create a real-time SAIDI map. And that’s only the beginning. 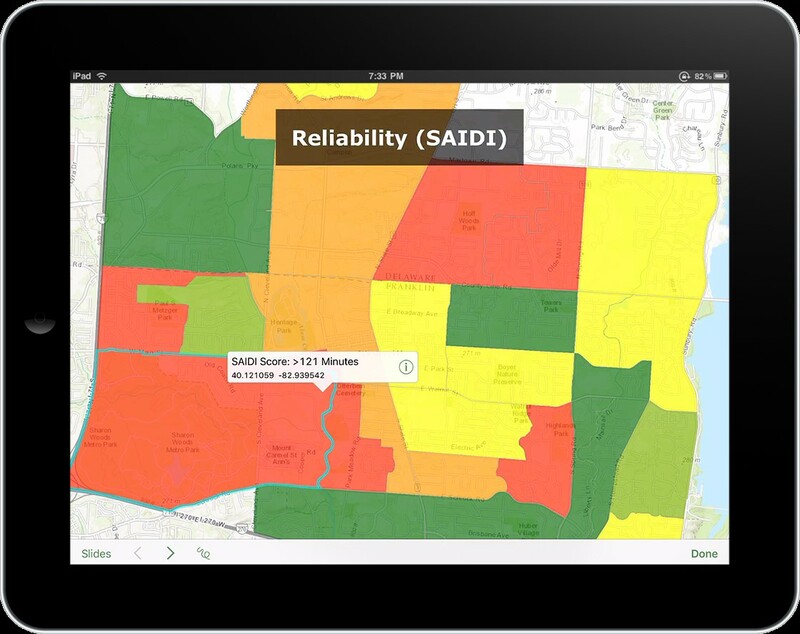 ArcGIS enables electric utilities to see and analyze real-time SAIDI reliability scores by area rather than by circuit. The result—in-depth insights that help utilities understand how they can enhance the performance of electric systems. How about creating a data layer showing past outages and their causes? What if we add a layer depicting where and when trees were trimmed? We could bring in a layer identifying open maintenance work orders. How about adding a layer for expenditure history by area? Just for fun, let’s bring the map a layer of our customer satisfaction surveys, organized by ZIP+4 code. Since our GIS models are electric circuits too, add that information in a layer. Bring it on! Rather than simply looking at all those layers, the ArcGIS platform enables analysis. It combines those layers in what GIS people call a mashup or weighted overlay analysis so I can discover the reasons for and impact of outages. I am able to access outage data in the platform. I have greater awareness of where outages occur. I now get insight into the causes, correlations, and impacts. ArcGIS gives me the ability to perform real analysis. I get to discover the why. Armed with the why, I can act (note the fourth A). The platform gives me the tools to answer these critical questions: Where are my biggest problems? Why did they occur there? What can I do about it? Like my wife’s wise, old Auntie Sadie, the ArcGIS platform can transform SAIDI from a static number into a dynamic, leading indicator of how to enhance the performance of the electric system. The result? Utilities can better serve their customers and community, and they may even save a few bucks in the process. For more real-world insight into GIS for the electric utility industry, visit esri.com/electric.